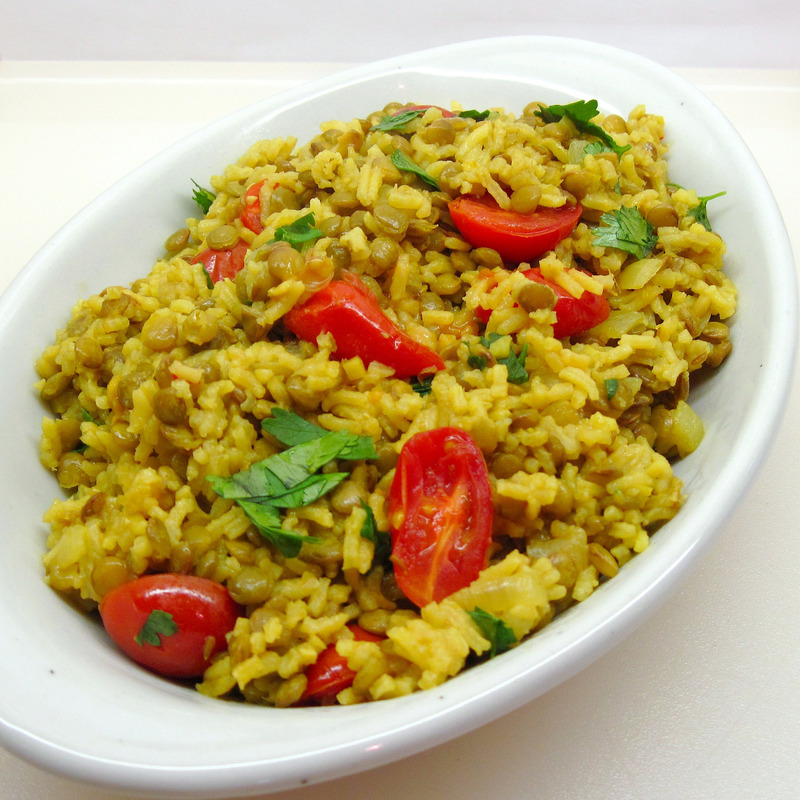 Indian-Spiced Rice With Lentils is a quick and easy one-pot dish that makes a delicious vegan main course; it would also be a great side dish for grilled meat….perhaps a Tandoori-style Chicken? I adapted the recipe from one that Carrie found on epicurious.com. The original recipe allowed only 13 minutes to cook the rice, which did not seem sufficient for basmati rice. I adjusted the timing, decreased the salt, omitted the sugar, and increased the ginger and turmeric. Chopped onions and grape tomatoes were welcome additions. I used “regular” brown lentils, the type found at any supermarket. 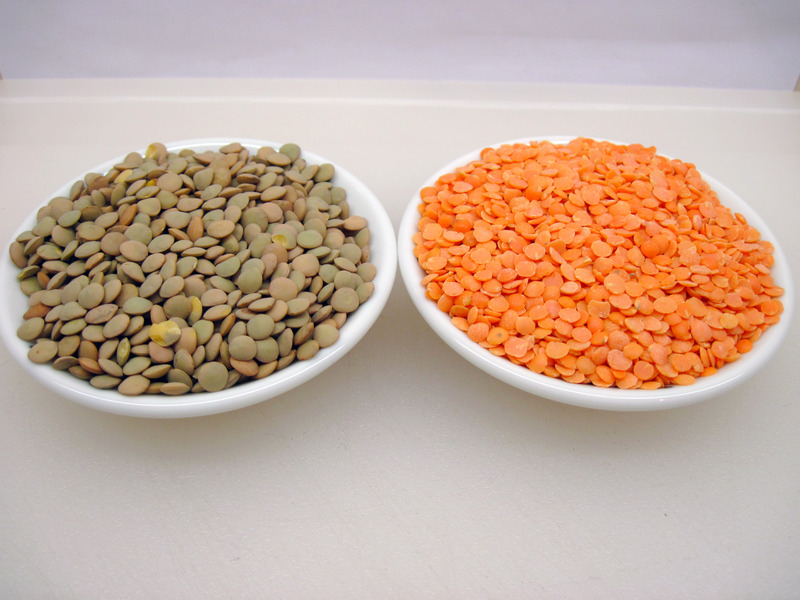 Red lentils are often used in Indian cooking; they cook much more quickly than other types of lentils. Next time I’ll try the recipe with red lentils. I’ll omit step 6 and add them when I add the rice, so the total cooking time for both will be about 20 minutes. We both really enjoed the flavors in this recipe. I think the only thing I might do differently would be to add a minced jalapeno or serrano chile when I add the cinnamon, cloves, and cumin; we do like a bit of heat in Indian food. A sliced mango was the perfect accompaniment with the Lentils and Rice, along with a salad of fresh lettuce from our garden. 1. Rinse and drain the lentils and place in a bowl; rinse and drain the rice. 3. 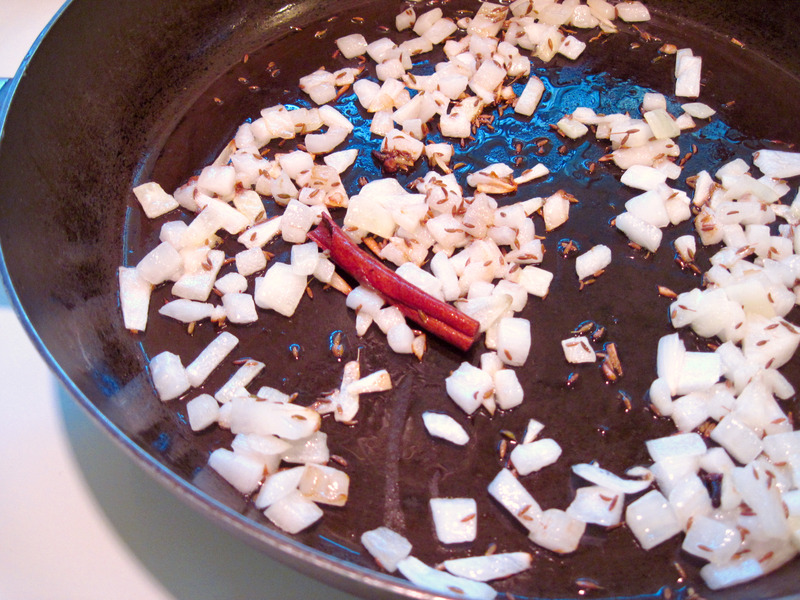 Add the onion and cook, stirring occasionally, for 6 – 8 minutes, until softened. 4. Add the cinnamon, cloves, and cumin seeds and cook for about 2 minutes. 5. Add the garlic, ginger, and turmeric; cook, stirring for about 30 seconds. 6. Add the water and salt; increase the heat to high to bring the water to a boil. When boiling, reduce heat to medium and add the lentils; cook for about 8 minutes. 7. Increase the heat to high and add the rice. When it comes to a boil, reduce the heat to medium and cook for 5 minutes. 8. Cover the pan and reduce the heat to a simmer; cook for 15 minutes, until the lentils and rice are tender and the water is absorbed. 9. Stir in the tomatoes; cover and remove from heat. Let stand for 5 minutes. 10. Stir in the cilantro and lime juice and it’s ready to serve. oh dear ….. this is brilliant stuff. i recall my mummy making this and we call them KITCHDI. i love this…. What kind of lentils did your mother use? And do you think a jalapeno or serrano chile would be a good addition? This sounds very tasty! I love all the seasonings in this dish. hi, i am pleased to present you with an award that’s waiting on my blog. Thank you so much, Abraham! 🙂 You have a wonderful blog. Thank you! This is definitely a “keeper” in our house. Looking good–and I have all of this on hand. I bought lentils recently and just have had no clue what to do with them. Thanks for the inspiration! Thanks, Baking Barrister! I’ll be interested to hear how this comes out for you, if you make it! first time here n amazed with ur recipe collection …each recipe is so unique …this indian spiced rice looks soooo delicious ..u made it very nicely …we call this kichidi n we prepared this rice mostly with mung lentil and some times with split red gram with some veggies (potato)too …its one pot meal perfect for breaking a fast or for just a jiffy meal…very happy to visit ur space…. Thanks so much for your informative comments! Potatoes would be so good in this; thanks for that suggestion. i’m Chinese and have been trying to find easy-to-cook Indian one-pots for busy days. My family would love this!